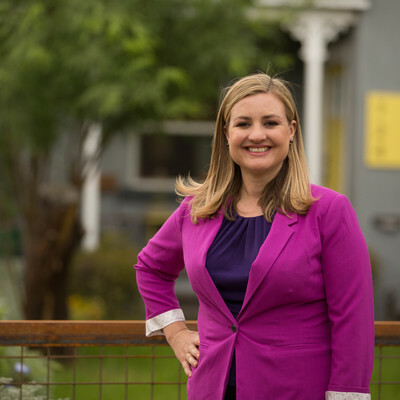 Kate Gallego is a mom running to be the mayor of Phoenix; she was first elected to Phoenix City Council in 2013. Prior to being elected, Kate worked on Strategic Planning and Economic Development for Salt River Project. She graduated Phi Beta Kappa from Harvard University and earned an MBA from the Wharton School of Business at the University of Pennsylvania. In 2015 the Wharton School of Business named her in its “40 Under 40” list. Kate is a strong proponent of investing in the infrastructure and is a member of the bipartisan coalition Building America’s Future. Kate has earned recognition from Women in Transportation and Friends of Transit and “Courage” Award from the Girl Scouts Cactus-Pine Council, Elected Official of the Year by the National Association of Social Workers Arizona Chapter, and the Rising Leader Award from the Anti-Defamation League. AZ Business Magazine named her as one of the most influential women in business. Kate’s entrepreneurial spirit and extensive economic development knowledge have helped transform Phoenix’s economy and revitalize the city’s transportation system. Kate’s proven track record includes leading the campaign to pass Phoenix’s citywide transportation plan and spearheading the successful Phoenix Equal Pay Ordinance. She led the effort for the city to partner with AARP to better serve older adults. She has encouraged more young people to enter the construction workforce and championed innovative partnerships with ASU and the University of Arizona. Kate Gallego believes that everyone should have access to cutting edge medical care leading to expand Phoenix’s biomedical campus. Kate has consistently fought for and delivered progressive victories for Phoenix adding 7,000 jobs since 2013 and is poised for continued growth that is both sustainable and inclusive. Kate chaired the Prop 104 campaign to invest another $31.5 billion in our transit system and fast-track light rail to South Phoenix, in neighborhoods that needed it most. With immense community support, her district has seen the rise of the Phoenix Warehouse District—one of the hottest tech scenes in the country. In just the past couple years, nearly 100 startups have sprouted up in this once-dormant part of town, bringing well-paying jobs of the future to people of all backgrounds and levels of education. In the era of climate change, Phoenix has the most to lose, with rising temperatures, extreme drought, and intensifying wildfire. As chair of the city council’s subcommittee on sustainability, Kate has helped put Phoenix on a path to a zero-waste, carbon-neutral economy by 2050. Kate has a long and proven track record winning progressive victories for the residents of Phoenix and as a mayor she will continue the fight for racial and economic justice in making sure that Phoenix leads the way in job growth, blooming tech industry, responsible environmental policy so that it works for all people.